There is one problem about being religious. You are taught that the supernatural exists – miracles, angels, the resurrection of the dead – but for some reason it always seems to happen off stage, either somewhere else or somewhen long ago. You actually have to live in exactly the same boringly unsupernatural world as do the unbelievers. It must be hard work believing in things which never actually happen. 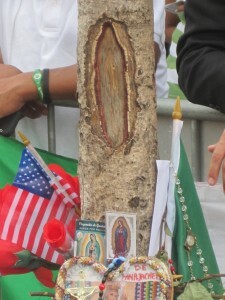 This miraculous image of the Virgin Mary has recently appeared on a tree in New York. The tree has become quite a shrine it seems. 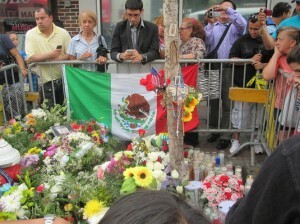 Someone has even adorned it, for some reason, with a full-sized Mexican flag.